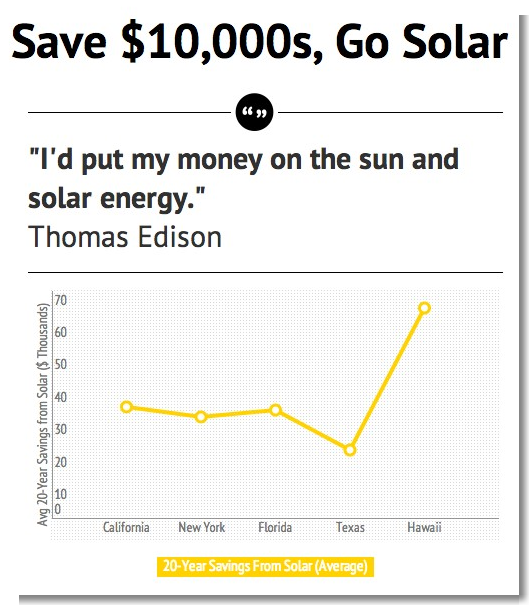 Home Going Solar	How Much Are Solar Panels?… Or, How Much Are Solar Panels Gonna Save Me? OK, it’s true, How Much Are Solar Panels? can be a useful question. But, really, this question is largely of minimal importance today. Either through loans or 3rd-party-ownership models that let you lease a solar power system instead of buying one, most residents and businesses with a decent roof or ground space for solar panels should have an opportunity to go solar without buying the entire solar panel systems up front. The real questions — the real ways in which going solar affects your finances — is in how much it saves you and how soon or when it starts to save you money. I recently created the short infographic below to highlight the 20-year savings from going solar in some of the most populous states in the country, as well as in Hawaii, which has the greatest average savings per project. These numbers were included in a cool solar power infographic I shared last week. However, the map displaying these numbers was number 3 of 4. I’ve gone ahead and pulled out this key map and will insert it below so that you can see savings in your specific state if you don’t live in one of the four most populous states or Hawaii. Solar Energy Problems? Solar Energy Spills?